Professor Don Williamson speaks to the crowd in front of the Tax Center. At the Kogod Tax Center's official launch on April 15, Professor Don Williamson maintained that taxes are not cruel, just misunderstood. Dean Richard Durand and Provost Scott A. Bass joined Williamson and other leadership for an open house at the newly unveiled Center, located near the Tenley campus at 4545 42nd Street NW. A milestone for the Kogod School of Business, the Tax Center is led by Executive Director Donald Williamson and Managing Director David Kautter, and is dedicated to promoting balanced, nonpartisan research and expanding knowledge with respect to tax policy, planning, and compliance for small and mid-size businesses, entrepreneurs, and middle income taxpayers. 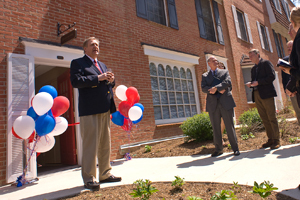 An informal event, guests enjoyed hors d'oeuvres and beverages prior to a dedication ceremony and ribbon cutting. Jessica Hallstrom, communications director for the Tax Center, gave tours highlighting the center's design elements created by architect Dino Constantino. In front of the Center, Provost Bass welcomed those present. "This center will address fundamental issues relevant to the university, country, and presidency," Bass said. "Kogod is moving toward a new level of achievement and I look forward to the engagement of the entire AU community." Dean Durand followed Provost Bass, echoing the pioneering nature of the Tax Center. "This is a major center and is the beginning of many policy-related centers at the university," Durand said. "This Tax Center, built upon an outstanding Master of Taxation (MST) program, will create a collinear relationship, where each element makes the other better." The MST program provides a professionally oriented, specialty master's degree that offers unmatched working knowledge of tax law and is the only program of its kind in the mid-Atlantic region. The Center's overarching goal is simplifying tax law to ease compliance and boost small business growth and, ultimately, job creation. The work coming out of the Tax Center will spur innovation and create a more resilient middle class, ultimately leading to a stronger competitive edge in the global economy. It will facilitate dialogue to inform a wide range of stakeholders—including taxpayers, policymakers, academics, the press, and tax practitioners—about complex tax issues. After the ribbon was cut, a champagne toast commemorated the launch and a cake decorated with an edible 1040 tax form was served. "This Center will separate Kogod from every other business school in America," Williamson said. "There is also personal fulfillment…it's a great compliment and show of confidence." Kautter hopes that the Tax Center will have a significant impact on tax law. "In time, I think this center will play an important role in facilitating tax enactments for small business," Kautter said. By increasing public understanding of tax laws and drawing attention to the potential impact of tax reform, the Kogod Tax Center hopes to significantly influence the future course of the nation's tax code.